Offered are Panoramic Direct OCEAN Views from inside the comfort of your Modern Designed Clean, Cute and Comfy Oceanfront Condo. 600 feet of Pristine, Secluded Beach and a Crystal Clear Pool await just outside your door. Entire Unit Remodeled in 2018! Your space features New Custom Tile Shower, New Luxury Plank Flooring, New Cabinets/Countertops, and New Furniture, & Bedding. Stay connected with friends/family, or work on the go with our Complimentary Hi-Speed Wifi. Enjoy fabulous local cuisine from our list of recommendations, or relax to open air dining and cook on the BBQ Grills. Restaurants and the famous Molly's beach bar, are a short walk away. Perfect getaway for a romantic weekend, or a family retreat ... watch dolphins splash from the oceanside gazebo ... don’t miss the sunset disappear beneath the ocean waves .... stroll the sandy beach ... build a sandcastle with the kids ... surf cast or fish from nearby pier ... watch surfers hang ten.... or just relax by our chlorine free all natural saltwater pool, complete with a 1.5 foot deep fenced in kiddie pool for small children. -SMOKE FREE COMMUNITY. No smoking anywhere on the premises. -Linens include sheets, comforter/blanket, pillows, and bath towels/wash cloths. -Bring your own Beach towels. -Coin operated laundry facility on property. - 2 vehicles allowed per unit rented. - No boats or trailers allowed on the premises. - Pool, parking, and beach access only for registered guests. Please do not invite anyone over who does not have a reservation. -After making a reservation you will receive an information packet including a list of our favorite things to do and Places to Eat. -We include a List of Condo Rules, which all guests must follow. -Entry Instructions sent closer to your occupancy date. You have a Direct Oceanfront View (Only 1 of 2 in this entire building), the people are very friendly, and the Location is Fantastic! 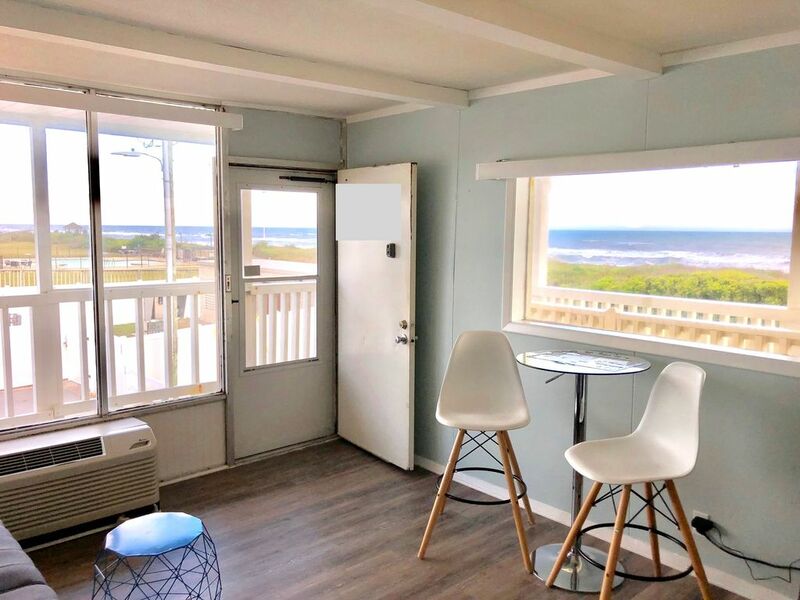 This beach condo has everything you need to make your summer vacation, or your weekend get-away a memorable experience. This property is a hidden gem that many people just don't know about! The truth is that many owners want to keep this piece of private beach a secret. The setting is amazing. Enjoy our charcoal grills, and have dinner with your family on our brand new picnic tables. You can enjoy the sunny outdoors, while listening to the sound of waves breaking on the shore, and the aromatic aroma of sea salt in the air! You just can't beat rolling out of bed, and in a few steps planting your feet into the warm, soft Atlantic Beach sand! Staying on the beach is the way to go! There is no need to worry about crossing busy roads, or paying for parking, etc.. And for those of you with kids, well there are many activities for them as well. There is a large green lawn area, so if they get tired of playing on the beach, they can kick the soccer ball, play horseshoes, or whatever activity sparks their interest. And there is even a small wading pool that is fenced in to keep those smaller children from wandering off. So regardless if you are vacationing for a week, or getting away for the weekend, come stay at my place, and please make it your own! I know you are going to have a fantastic time! toilet, shower, 2018 Brand New Custom Tile Shower! It's gorgeous! 2018 Brand New Custom Tile Shower! It's Gorgeous! Magnificent Direct Ocean Views from the comfort of your living area! One of only 2 units in this building with this type of view! 1 bath towel/wash cloth per registered guest. Rent and Canoe in Beaufort and head to Carrot Island to see the Wild Spanish Ponies! You can rent bicycles locally. We have a bicycle rack where you can lock up your bike. Lots of room on the Atlantic Beach bicycle path. Saltwater pool system saves your eyes from burning, keeps your bathing suit from fading, and your skin feeling fresh and clean! Fantastic Oceanfront Views! Plus you have a fully equipped kitchen at your disposal. Unit is professionally cleaned prior to your arrival. There is no Daily Maid service. This is a No-Smoking Community. Smoking not allowed on the premises. Guests must agree to read and adhere to Condo Association Rules as you will be our personal guest. Failure to follow rules could result in loss of damage deposit, additional fines and potential eviction. The room was clean and cozy. More like being in a dormitory room than a hotel. Bed was very comfortable. Awesome view and beach access.. convenient to everything! Lovely little condo., convenient to everything including Beaufort. Enjoyed my stay. As a single parent it is often unobtainable to find any place on the beach. Yet here we had affordable and luxury accomaditions on the beach with awesome neighbors and a super fun retro environment. Close to everything. Great location and an awesome view! My husband and I stayed for four nights in late August 2018. It was very nice and we will definitely stay there again. The space was perfect for 2 and it was very nicely decorated. The bed was sooo comfy! The windows were great and gave us a wonderful ocean view. It had everything we needed. We also enjoyed the pool and the convenient location. Great location and beautiful views! Great location and perfect size for two. Beautiful views! We enjoyed our stay. We did have lack of privacy from others, due to decking set up. Too many people standing outside our windows and door. Stay on Atlantic Beach! Stay 3 nights, a week, or a month! Some Attractions this year: 4th of July fireworks, MCAS Cherry Point Airshow w/ the Blue Angels, Beaufort Music Festival, Big Rock Blue Marlin Tournament, NC Seafood Festival, Summer by the Sea, Pine Knoll Shores Aquarium, Salter Path Clam and Scallop Fest, 6th Annual Flounder Surf Fishing Tournament, Buddy Pelletier Longboard Contest , Beaufort Blackbeard Pirate Festival, Ducks Unlimited 'Band The Billfish', Pirate Week at the N.C. Maritime Museum , Carolina Chocolate Festival, Crystal Coast Civic Center functions, Emerald Isle St. Patrick's Day Festival, Carolina Kite Fest, 11th Annual Antique-A-Thon , Fort Macon Civil War Reenactment, Annual Wooden Boat Show. Or you could just lounge at the beach/pool, fish, surf, play horseshoes, or enjoy the breathtaking sunrises / sunsets. Tennis courts & Golf courses nearby. Bike rentals w/ free delivery are available. Golf: Country Club of the Crystal Coast is just minutes from my property. They have very affordable rates!